we are all masochists. some of us deny it, but the truth is we all go through our lives making choices that cause us pain. some of us are perfectionists who are perpetually disappointed. the tortured artists are not artists because they are tortured; they are tortured because they are artists. of course there are always exceptions to the rule, but it seems to me most of us feel that if we’re not in pain there is no depth or meaning in our lives. we want things we cannot have. and in most cases its not that we cannot have what we want, but the act of wanting it insures that we will never have it. sometimes i think maybe we’re just too lazy to work for what we want, and in some cases that is true. but lets say you get what you want, then what? you need something new to want, and for some of us that thought is worse. there is this notion that the darkness and sadness are beautiful and poetic, but the truth is the darkness does’t have any answers. i personally don’t think that finding answers is the right goal to have in your life, because life lies in the questions you choose to ask. those questions define what your life is going to be and the path that you will take. whether or not you find the answer is irrelevant. and so the darkness may or may not have answers, but that is besides the point. the point is that in the dark you forget the question, and there is nothing beautiful and poetic about that. George Bernard Shaw once said: “there are two tragedies in life. one is to lose your heart’s desire. the other is to gain it.” you can agree or disagree with his theory, but you cannot deny that we all go through our lives wanting. sometimes we get what we want and sometimes we don’t. the real tragedy is that once we get something we want, we tend to forget just how much we wanted it. maybe that is why Shaw finds it a tragedy to get your heart’s desire, because what defines desire is the yearning and the want and once thats gone, its not really a desire any more is it? an unfulfilled desire holds within it so much energy that it drives us towards it. and once it is fulfilled the energy dissipates. 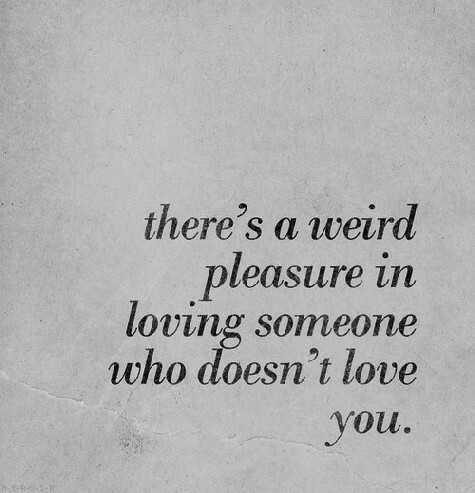 there’s a weird pleasure in loving someone who doesn’t love you. love is supposed to be selfless, and i suppose loving someone who does’t love you, is selfless because its a love that asks nothing in return, not even to be loved back. in that love is a desire that is constantly unfulfilled and its energy is ever burning. but at the end of the day no matter how you look at it, it seems that we are obsessed with feeling pain, as if that pain makes our lives more meaningful. masochists.